All Night Vigil is a public worship in the Orthodox Church and its name reflects the fact that it used to last all through the night. For many decades the worship included some customary chants. 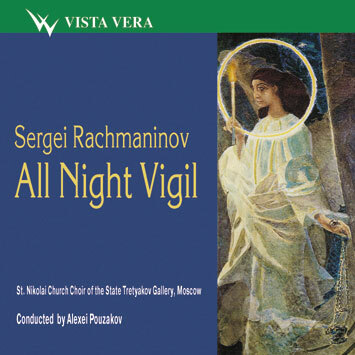 It was not until late 19th century that All Night Vigil became a more flexible genre, that attracted some prominent Russian composers, including Tchaikovsky. The premier performance of the Rachmaninov's All Night Vigil took place in 1915 not in a church but in the Great Hall of the Moscow Nobility Assembly. Thus liturgical music became music for the concert halls as well as for temples. Rachmaninov's genius manifested itself in an astonishingly free creative manner of musical composition based however on a deep and awesome study of the Ortodox liturgical singing tradition as well as on a daring and innovatory use of all the advanced methods of the modern classical music of the time. As a result a true masterpiece of polyphonic canticle arose. As Alexei Puzakov put it, you will not find here just the main part of soprano and accompaniment (all other parts).Each voice - and Rachmaninov involves 12 of them - like a human being in real life, performs his or her part which is unique and main for him or her. All these voices merge into a unique and inimitable in its beauty Divine symphony. St. Nikolai Church Choir is well placed to perform the great work by Rachmaninov. It is one of the best church choirs in Moscow, all its members are exceptionally talented professional singers It is a State Choir under the State Tretyakov Gallery. The choir performed All Night Vigil at the Great Hall of the Moscow Conservatoire, at St. Paul's Cathedral in London, but more often the choir sings during the services in the St. Nikolai Church which at one time was Rachmaninov's parish church. Cover: Mikhail Vrubel. Angel with a Candle, 1887.